The ‘files & folders’ operating system lies at the heart of many of Yamaha’s most recent keyboards and Clavinova digital pianos. 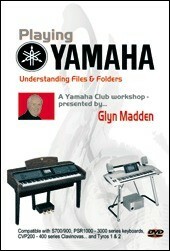 This step-by-step guide cuts effortlessly through the hi-tech jargon as Yamaha artist Glyn Madden joins forces with computer whiz (and cameraman) James Woodcock to show you how to ‘cut’, ‘copy’, ‘paste’ and organise style, song and registration files. Introduction. We welcome you to our DVD with a performance. 1.1 Creating a registration. Using registrations to build a ‘professional’ performance). 1.2 Naming registrations. Saving a registration file and using an ‘icon’ to provide a descriptive illustration. 2.1 Organising Files. Keeping your user pages tidy. 2.2 Cut, Copy and Paste - Creating a filing system within your keyboard or Clavinova. 2.3 Making Room. Creating space on your user pages. 2.4 Copying Files. Duplicating files on additional storage devices. 2.5 Moving Files. Moving files from one storage device to another. 3.1 Song Files. Recording and saving a performance file. 3.2 Emailing Files. Sharing files with friends via email. 3.3 Style Files. The accompaniment styles. 3.4 Voice Files. Organising voice files and locating the sound effects such as ‘helicopter’, ‘gunshot’ and ‘applause’! 4.1 Importing Software. Bringing external files into the keyboard from commercial software. 4.2 Common Mistakes. It’s easy... when you know how! 4.3 Multipads. Multipad files for keyboards. 4.4 Image Files. Creating and using background images to personalise your instrument. 4.5 Not Just for Tyros! We explain how this DVD covers many Yamaha instruments not used during filming - including the brand new CVP400 series Clavinovas and PSR-S900/700 keyboards. COMPATIBLE WITH: Yamaha PSR-1000, PSR-1100, PSR-1500, PSR-2000, PSR-2100, PSR-3000, PSR-S700 and S900, Tyros (1), Tyros2, Tyros3, Tyros4 and Tyros5 keyboards. CVP200, CVP300, CVP400 and CVP500 Series Clavinovas. (European PAL format only, Region Free! ).